Light maple engineered flooring plank with a 6mm solid maple top layer that is supplied unfinished. This highly stable wooden floor has been engineered by bonding a 6mm hardwood top layer onto a 14 mm plywood backing. These timber floors are suitable for laying over underfloor heating, but maple is not as stable as some of the other wooden species that we can offer, therefore a small amount of movement should be expected. Our engineered wood flooring can be installing directly to concrete and timber subfloors or spanned over timber joists. 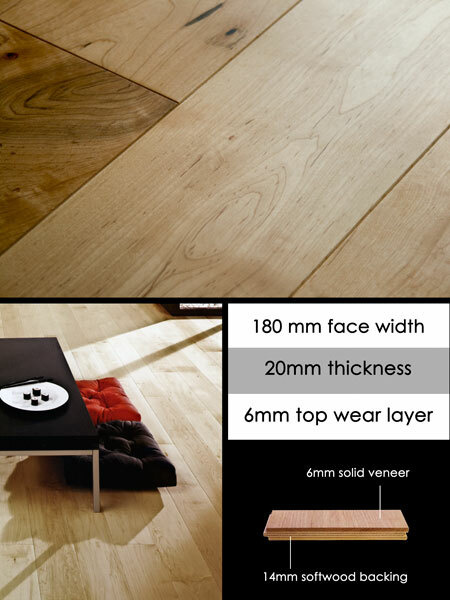 Width 180mm x 20mm thickness. * 6mm maple top layer. * Made to special order allow 5 weeks.